In July 1845 two ships were docked off Canada’s coast waiting for good weather conditions, so that they could embark on an Arctic expedition. After that, the expedition with a crew of 129 was lost for several years, leaving no survivors. For several centuries, Britain consistently sought to expand its trade across the globe. To deliver on this vision, all that was needed was to find a Northwest Passage that would enable ships to sail from the Atlantic to the Pacific by circumventing North America from the north. The British Admiralty assigned this mission to John Franklin, a 59-year old captain who had taken part in three Arctic expeditions. Between 1819–1822 he led expeditions to and along the Arctic coast of Canada, during which his crew fell short on provisions, and had to stew up leather shoes, after which he was called the "man who ate his boots." He also explored Alaska and was Governor of Tasmania. 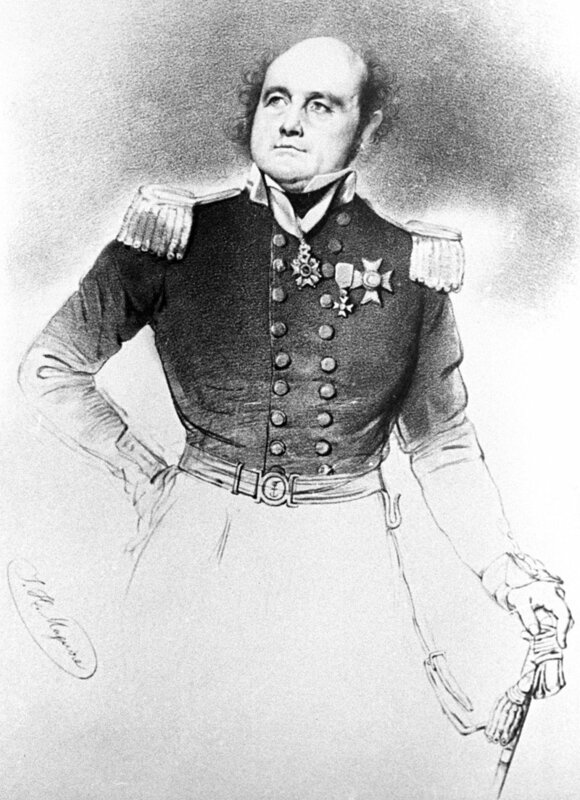 Francis Crozier became the second captain on the expedition. He had already taken part in six other expeditions to the Arctic and Antarctic, including the one that led to the discovery of the south magnetic pole. He could also speak the Eskimo language. Despite all his skills, Crozier was not picked to head the expedition, probably due to his Irish roots and the fact he was a Catholic. Both ships had already been to the Arctic, and their hulls were reinforced with metal plating. In addition to this, steam engines were mounted on the ships, alongside water distillation and heating systems. Almost 100 tons of provisions and 4 liters of lemon juice to treat scurvy were loaded onto the ships who set sail on May 19, 1845. No one had any doubt that the expedition would be a success, except for Arctic explorer Richard King, who believed that a smaller crew with all members experienced in the Arctic should have been sent instead of 134 people, of whom only 24 had ever been to the Polar region. However, no one heeded King's warnings, arguing that he had never served in the Navy and was unable to understand these matters. In July 1845, the ships docked in Greenland's Disko Bay to get provisions and send off five crew members who violated the captain's ban on swearing and drunkenness. The crew also sent letters back home with Franklin writing: "We are confident in our success. Next stop Hong Kong." Everyone knew that searching for the Northwest Passage would take more than just one wintering, but the complete lack of news was starting to make the Admiralty uneasy. In 1848, it was decided to send three more parties to search for Franklin and his crew. Captain Henry Kellett was instructed to sail to the Bering Strait, where Franklin was to arrive, having made his way through the Arctic ice. The second search party headed by Sir James Clark Ross was to sail to Lancaster Sound, where Franklin's expedition began. An overland rescue party headed by Doctor John Rae and Sir John Richardson was to search the territory down the MacKenzie River to the Arctic coast. 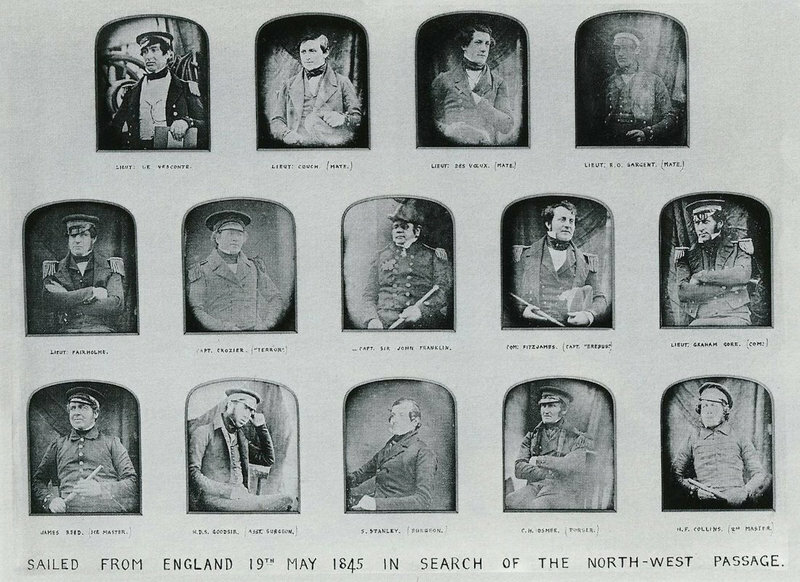 None of the search parties managed to find any signs of the missing expedition. 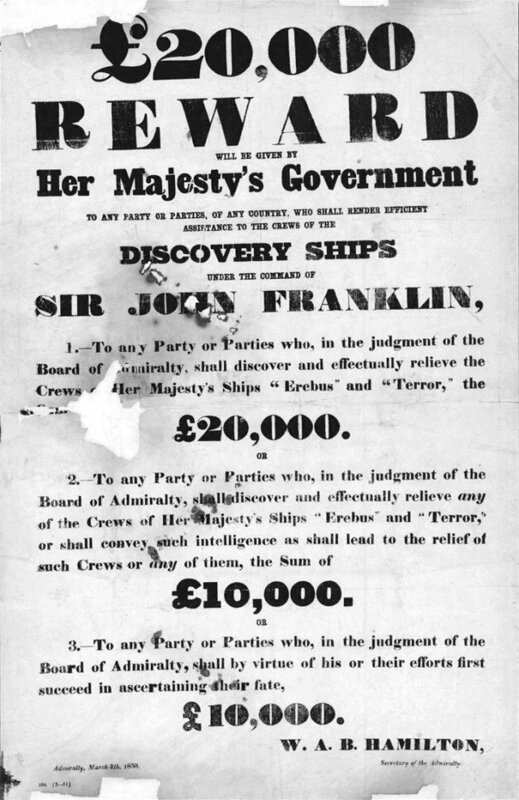 On April 4, 1850, the British government offered a reward of £20,000 "to any Party or Parties, of any country, who shall render assistance to the crews of the Discovery Ships under the command of Sir John Franklin", and £10,000 to anyone able to rescue or find, dead or alive, any member of the crew, or provide the government with information that could help to rescue the missing expedition. On August 27, a sailor from Lady Franklin ship's crew headed by Captain William Penny gave out a loud cry: "Graves, Captain Penny! Graves! Franklin's winter camp!" On a small Beechey Island, not far from Devon Island, the crew found the graves of John Torrington, William Braine and sailor John Hartnell, indicating that the three crew members perished during the first over-wintering. Then the crew found other relics, such as the remains of a camp, a former site of a forge. 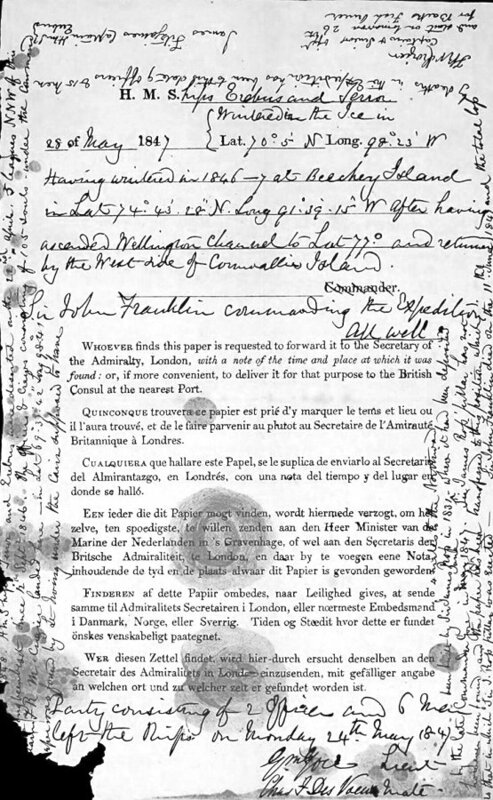 The most important discovery made on Beechey Island was the report on the first year of the expedition. After this, the search stalled; food supply problems became the official reason behind the death of the crew. In 1854, Doctor John Rae, former member of the overland rescue party, examined the Boothia Peninsula south of the Beechey Island. He knew the Eskimo language; that was how he got statements from the locals who said that several years prior to meeting Rae, they had seen 40 white people heading south, and claimed that there were bodies and cauldrons with human remains nearby. At the same time, Lady Franklin did not lose hope of finding her husband. She collected the money to purchase the steam schooner Fox and in August 1858 launched an expedition led by polar explorer Admiral Francis McClintock. At the site of Franklin's first winter camp, they met Inuit families who told them about white people whose bones they had found near the big river. 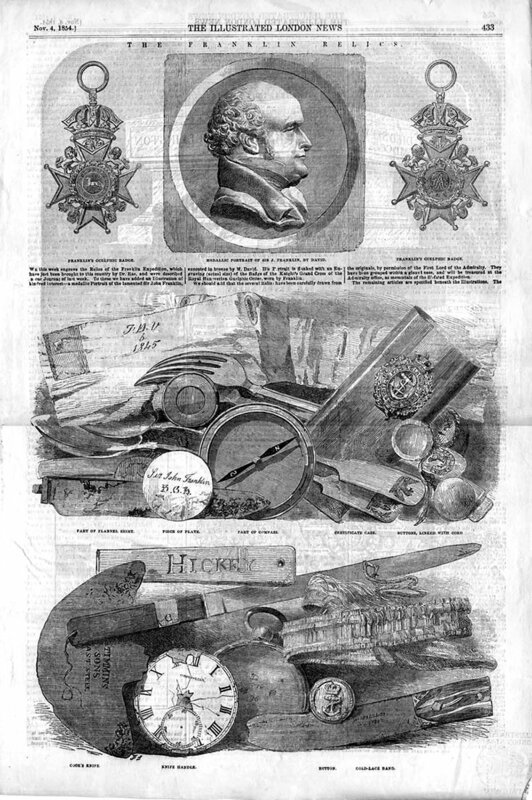 The expedition purchased from them silver plates with the monograms and initials of Franklin, Crozier and two other officers. On May 24, 1859, on the sand bank near the mouth of the Peffer River on the southern coast of the Island of Montreal, McClintock found a human skeleton dressed in the uniform of a steward from the lost expedition. At the same place, under two cairns a message was found which cast light on the fate of the travelers. In September 1846, both ships were trapped in ice, and the crews had to spend two winters on King William Island. The mortality level among the sailors exceeded all limits, and on April 22, 1848, they had to leave the ships. The remaining 105 crew members set up camp on the island's northwestern coast and prepared to go south, to the mouth of the Back River. They had a difficult route ahead to the remote base of the Hudson's Bay Company in Fort Resolution, 2,210 km from their camp. On April 26, Franklin's expedition began its way along the southern coast of King William Island. They were tied together and dragged the rowboats they took from the ships. It was hard physical labor which took a toll on the crew's health. McClintock found a field hospital set up by Franklin's crew. Having summarized all the facts, McClintock made the following conclusion: "It is also reasonable to suppose that nearly all were far gone in scurvy when they landed; and the change from a confined lower deck and inaction to extreme exposure in an Arctic temperature, combined with intensely hard sledging labor, would almost immediately mature even incipient scurvy. The 'Hospital' tent, within eighty miles of the spot where their march commenced, is, I think, conclusive proof of this." In 1981, Canadian scientists exhumed the bodies of three sailors who died on Beechey Island during the first wintering in 1846. The study showed that the sailors died from malnutrition, pneumonia or perhaps tuberculosis. The remains also contained a lot of lead, which might have been caused by badly soldered cans with tinned food. The water distillation systems aboard the ships also had an increased lead content.